Q. IISc is already a brand, how will getting the ‘IoE’ status will help the institution, how do you now plan to scale up things? 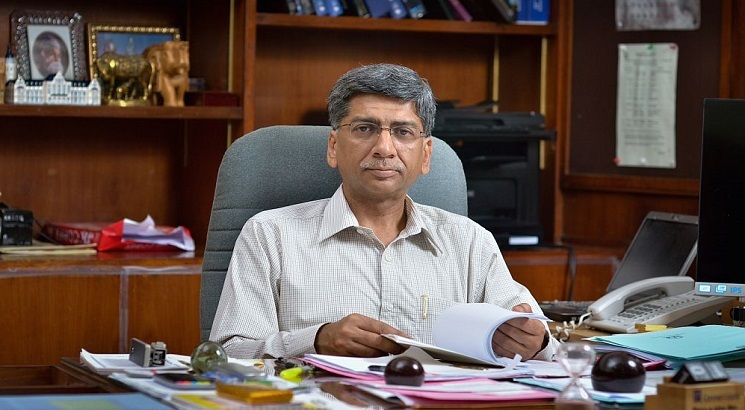 A. IISc will not scale up in the same way, we are largely a Postgraduate institution by and large and our largest number of the student population are PhDs. We are going to scale up faculties. Presently, we have 440 faculty members, we would like to add 100 more in the next five years. The scaling up of students in an institution like ours depends on faculties. Typically, we have six PhDs per faculty so, if you have more faculties, you will have more students. We will have two master’s students per engineering faculty and we will have few more UG students. Ultimately, we will retain a 9:1 or 10:1 ratio as we grow. So, in the next five years, we plan to have something around 5500 students and around 550 faculty members, that's what we have mentioned in our proposal. So, it is very much faculty dependent, you cannot simply grow students because it is a PG institution by and large. Q. How do you plan to recruit international faculties? A. Around 95 per cent of our faculties are trained overseas because either they have PhDs from abroad or have postdoc from abroad or have taught at foreign institutions. So, it is already very international, the question is not that whether these faculties are internationally trained or not, the question is whether they have international passports? It is good to have a cultural mix before we could do that. Ideally, we would like to make our campus much better. Q. Do you plan to expand the campus, currently it is located in the heart of Bangalore? A. Being an urban campus, IISc campus cannot be expanded and we have a new campus coming up 200 Kilometres away in Challakere. The Challakere campus will not have a much academic role to play in the next five to ten years. Our Bangalore campus has enough space and we will expand vertically and the kind of scaling we require does not require much space. We have already planned hostel growth, laboratory growth we need to add some more that would be enough. Q. A recently published report on research publications in Indian institutions, mentions that the number of patents granted is very less, with IISc doing marginally better than the others. What are your views? A. At IISc, we file approximately 40 patents a year and patents granting process takes five to six years. So, looking at our profile in last three-four years, we have started to bag about 10 patents every year because they were filed much earlier. So, you need to start filing for patents that's the most important thing. Q. Some of the universities claim that they file 100s of patents every year, but they hardly get one patent granted? A. You have to not file trivial patents, you have to file patents which are meaningful. Moreover, filing patents should not be the primary objective. The primary objective is to do quality research. Patents are also very expensive to file so it is also not just about money. Q. How do you plan to utilise the Rs 1000 Crore funding granted to the IoE? A. The money will not come in one go, we will be receiving it over the period of five years. In the initial duration before finalizing the proposal, I have had long discussions with my faculty members and we found certain deficiencies in the faculty field. So, we will be working on plugging those gaps, initially, it will be more about plugging the gaps in our ecosystem. We already receive a fair amount of funds from the government to run equipments and laboratories but we are not able to run them efficiently. We will be working to promote post-doctoral culture, which is weak in India. With a lot of post-docs coming in, we will have to plan post-doctoral housing as well as scholarships. Not only will we be hiring international faculties, we are also planning to make our own faculty travel. In the existing mechanism, we do not have enough funds to make our faculty travel. The most important thing now will be to improve upon our present achievements. Q. IISc is a deemed to be university with a fair amount of autonomy, how IoE will enhance that? A. Some of the procedures, like the five-year UGC review, will be done with. We will be able to define our own curricula and courses, which to some extent is already being done but now these things will be formalised. A number of things will be still be continued like NAAC accreditation, and AICTE accreditation for our tech degrees. The IoE status is a continuation of some regulations and some regulations have been relaxed. Q. The IISc is already among the top 200 globally, when we will see it among the top 100? A. The higher you go in the rankings, the more difficult it becomes. For an increase in every ten ranks, we have to put an enormous amount of effort. Our effort is to strengthen our research. If we want to benchmark ourselves internationally, then we have to see our efforts in comparison to the best universities in the world. As well as our efforts in terms of the investment being done on us and if we are delivering what is expected of us. Q. What are the new areas IISc is planning to explore with the kind of scientific developments happening around the globe? A. Every area has a potential to grow in Science. A lot is being done in Physics, quantum technologies, quantum computing. In Semiconductors technologies people are looking at new kind of devices which could bring together multiple modalities on one device like sensing, computing and communication packaging at a very extreme scale. Fields like Chemical, Biology and Cancer Research also has huge potential for growth. Faculties at IISc work in their field with a vision.